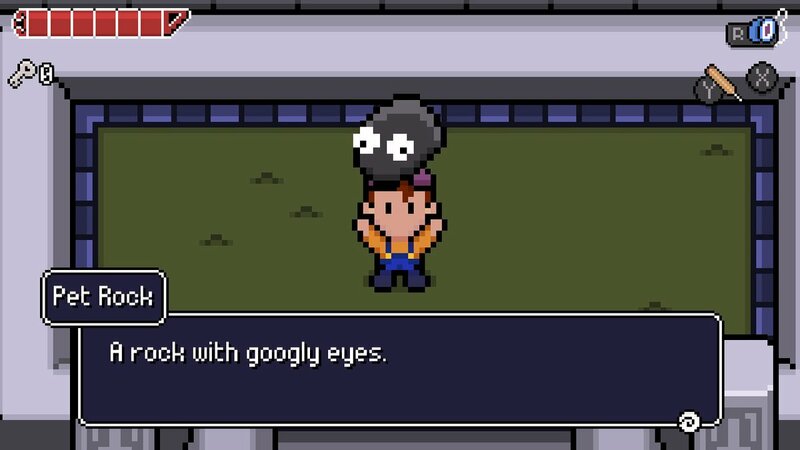 I’ve been interested in Reverie since another one of our writers reviewed it on Vita. It looked to capture the style of series I love like Earthbound and classic Zelda and hybridize them into a unique looking package. Thanks to the release of the Sweet As Edition on Switch, I took the opportunity to get some hands on impressions of the updated version. Was Reverie all that I hoped for, or was I too blinded by nostalgia? Though I didn’t play the original release, I feel I should gloss over the new features in this edition real quick. Here they are – Nightmare Difficulty Mode, a new Minigame, Quick Select Item Wheel, Stamp System (which is essentially trophies), additional NPC dialogue and updated sprites. I didn’t actually try the harder mode, since I feel that’s mostly for those looking to beat the game a second time, and I’m still working on the last couple dungeons. Likewise, I can’t attest to the updated sprites and additional dialogue. I did however encounter the stamps several times, and thought the new Minigame was fun. It involves shooting targets with your totally not a Nerf gun, to be awarded with a Feather (more on those later). Finally, the Item Wheel was very handy, though I didn’t initially know it was new. It takes a mere press of the shoulder buttons to bring it up, and another to equip the selected item. With the new features out of the way, now I want to talk about my direct impressions from the game. It starts out pretty charming, and sets the tone with a tale of woe that sets the stage for the supernatural events you investigate. I thought the Maori lore behind the game was interesting, though I felt perhaps more could have been done to explore it further. It kind of struck me as a rough draft instead of a final published story, as it were. Nevertheless, there’s a lot of charm in the game. A lot comes from the SNES styled art, which brought back fond memories of Earthbound. Even more comes from the zany items you find. There’s the standard stuff like a projectile gun, but then there’s weirder like a yo-yo that stuns foes and a plastic beach shovel. Strangest of all is the googly eyed pet rock, which can be used to depress switches in puzzles. And it doesn’t stop there, either. While most foes are run of the mill animals or the occasional magical foe, the bosses are all nuts. The very first boss you face is a haunted dryer, and another is a living tombstone. Odd to say the least, but still charming. Less charming are the puzzles in the game. They start out fine, but get more and more complex as you progress. I hate when I have to look to FAQs and guides to get past an area, and I had to do that multiple times in the later dungeons. Worse is that the game doesn’t really tell you what items do. For the standard items, it’s pretty self explanatory. But for the more esoteric ones, a little more direction wouldn’t have hurt. That Pet Rock I mentioned earlier, for example, can be hit with your cricket bat and richochet off walls. I had zero idea that was possible, and as a result was completely baffled in one puzzle. While I don’t think most gamers need or want their hands held, a little clarity can go a long way. Also, while I like Quick Select Item Wheel, it’s slow bringing up the world map. It takes a good couple seconds before it appears on screen, and that’s the case even if you don’t use the Wheel to access it. Considering how fast everything else goes, that’s a little annoying. It also frustrated me that after you collect a key item, such as a Boss Key, the game will lock you in place for a good 5 seconds. First time it happened I thought the game had frozen, but quickly ascertained it was the norm. Thankfully, there are things that ameliorate this, such as being able to save anytime, anywhere. Always a nice feature in games. That said, I like how the game gives you hints where to go, and lets you explore at your own pace. Sure you can tackle things in a linear fashion, but it’s fun exploring the island and looking for hidden nooks and crannies. One of the more important optional quests is finding all the feathers on the island so your grandparent will make you a Kahu (i.e. cloak) to protect yourself with limited invulnerability. It’s also fun just doing random things, such as the Minigame I mentioned earlier, or playing a faux arcade game to earn another feather. For a relatively small game world, it doesn’t feel that way. All in all, I think I can safely recommend Reverie: Sweet As Edition. It’s far from perfect, but despite the annoyances there’s a charming game here. The nods to games of the past don’t diminish the quality of this game, and it never feels overly derivative. Most of the time it exudes a quality of island zen that is pretty unique. Sure, I would have liked more content and perhaps more story, but I can’t complain too much. If you’re nostalgic for the SNES games of yore and want something fun and different to play, you can’t go wrong for only $12.99. Here’s hoping Rainbite gives us a sequel set in the same universe to expand on the things the game does best.